The essential relationship between our gut and brain is only just being understood. 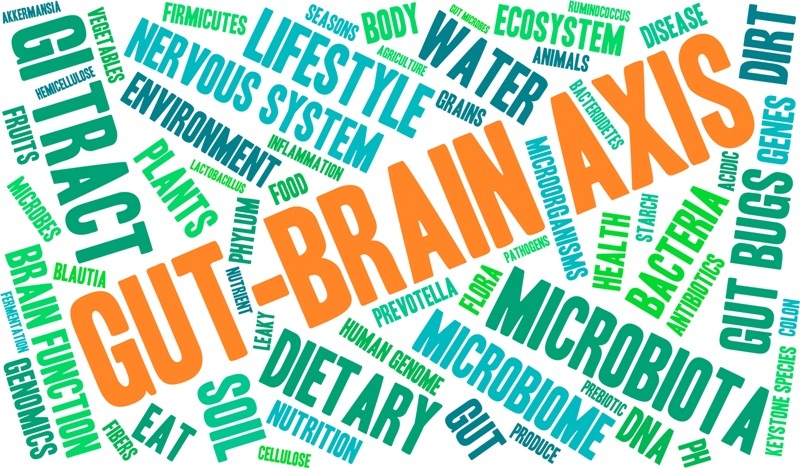 The more we discover, the more the science reveals the connection between gut and brain health. In the first of PerformancePro’s new series of Gut Insights, our Nutritionist and Naturopath Cathy Williams digs deeper to reveal some astonishing facts about how our gut and brain communicate. We’re all familiar with the feelings of nausea and butterflies when we’re feeling nervous or anxious about something. Or, maybe we’ve experienced constipation, diarrhoea or an upset tummy when we’re stressed out. But what we’re less in tune with is how changes in our gut and digestion can impact our brain and mood. The gut has its own nervous system – the enteric nervous system – and (fun fact alert!) contains about as many neurons as the whole brain of a cat! The vagus nerve connects the gut and brain and serves as a communication cable between the two. What was once thought to be a one-way street (brain to gut) is now clearly shown to be a two-way street. Information goes from the gut to the brain too. In fact, it’s likely even more messages are sent in this direction than the other, and on a daily basis. But this communication between gut and brain is only part of the story. One of the biggest ways your gut impacts your brain is when inflammation causes systemic changes. Disruption in the delicate and important lining of the gut (also called the gut barrier). This leads to a ‘leaky gut’ which allows particles to enter the bloodstream that normally shouldn’t. This can result in food intolerances, autoimmunity or generalised inflammation. Both your gut barrier and your gut bacteria work together to support effective digestion, immune health, and overall wellbeing. The statistics around Alzheimer’s and dementia are startling. This will increase to over 1 million by 2025 and over 2 million in 2050 based on current growth rates. Despite decades of research, the actual cause of Alzheimer’s remains unknown, however it is now frequently being categorized as an inflammatory condition. Furthermore, strong links are now being made between gut-derived inflammation and changes in the gut integrity and environment and many other neurological conditions. It’s not just about Alzheimer’s and dementia, other conditions and disorders such as ADHD, cognitive decline, MS, Parkinson’s disease and mood disorders are now being connected to inflammation. Alzheimer’s patients have been shown to have decreased diversity of the bacteria in their gut. Higher diversity is linked to higher health status and lower disease risk all round. Alzheimer’s patients have higher levels of specific bacteria, also found in patients with type 2 diabetes, and Parkinson’s disease. These bacteria have cell components that cause leaky gut and trigger systemic inflammation including inflammation in the brain. A leaky gut also tends to correlate to a ‘leaky brain’. Much like the digestive tract, the brain is normally surrounded by a strictly regulated barrier, known as the blood brain barrier. Only specific particles can get through from the blood. However, inflammation can make this barrier leaky too, so particles which shouldn’t be in the brain can get through and cause damage and inflammation. Alzheimer’s has recently been coined ‘Type 3 diabetes’ due to the finding that insulin resistance can occur in the brain in advance of the disease. This is much like insulin resistance in the body tissues that occurs before Type 2 diabetes. This finding strengthens the link between the gut health and brain health as inflammation and leaky gut are key drivers of insulin resistance and Type 2 diabetes. Up until now, we have tended to think of brain disorders as either psychiatric conditions or isolated to the brain environment. New research, however, is opening up a whole world of possibilities to prevent and improve these conditions through improving gut health and reducing systemic inflammation. The composition of the microbiome changes over time, when the diet changes, and as overall health changes. This is both good news and bad news in practice. It means we have to continually be aware of what we’re putting into our mouths to ensure we’re cultivating the best possible gut environment for overall health. But it also provides incredible hope for people suffering from cognitive decline and neurological conditions. And, it’s good news for those of us wanting to keep our brains in tip top shape long into old age! To find out more about how to integrate good nutrition into your daily life, contact Cathy at PerformancePro. Whether you’re looking for general Nutrition Coaching or feel you need a more in depth Functional Health approach, your first step is to contact PerformancePro for a free consultation. You will meet Cathy to discuss where you’re at, your needs and goals and how we can help you get there.